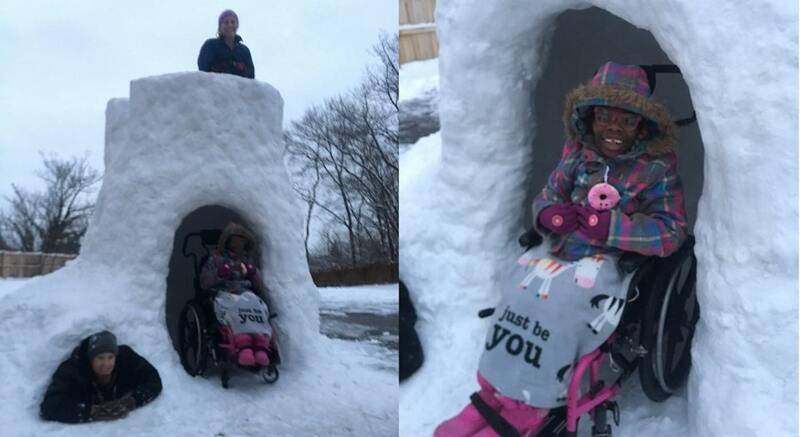 A doting dad built a handicap-accessible snow fort so all of his children could play together – and the photos of the winter castle are melting hearts across the internet. Greggory Eichhorn and his wife are the proud parents of nine kids, all of whom are adopted and have special needs. So when their home in Cincinnati, Ohio was blanketed in snow last week, Eichhorn built a massive igloo for his kids to play in. Not only that, he added a little nook at the base of the tower so that his two kids in wheelchairs could join in on the fun. A friend of Eichhorn posted photos of the snow fort to social media, and the sweet pictures have generated thousands of comments praising the dad for his simple labor of love. Eichhorn has since responded to the outpouring of appreciation by saying that he and his wife are happy to shower their kids in adoration. They also hope that their parenting will inspire other families to adopt special needs children.